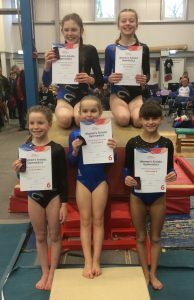 WWG Gymnasts Finish the Competition Year in Style! 6 WWG gymnasts travelled to Plymouth for the last competition of 2016: South West Regional Grades on Sunday 4th December. All 6 gymnasts achieved a Distinction in their Grade, making 2016 one of our most successful years to date. Jazmin Filer, Aoife Bolland, Leona Britton, Grace Till and Kiera Bridgman achieved Distinction at Grade 6, and Abbie Brown at Grade 5. Special congratulations go to Leona, who placed 1st overall out of 37 gymnasts at Grade 6, and Jazmin Filer, who placed 1st on beam out of the same 37 gymnasts. Congratulations gymnasts, coaches and WWG!